Tis The Season To Stay Busy If You’re A True Real Estate Entrepreneur! Sometimes life is crazy, right? And sometimes it just moves fast. Or maybe that’s just the way things work for me. So, what’s been happening here at CFD? For one, I just got back from a pretty big speaking gig, which was a whole lotta fun. That was at Freedom Fast Lane with Ryan Moran. Seriously, it was a blast! Oh, and my newest short-term rental property is starting to get bookings! That’s pretty exciting stuff. Plus I just signed the leases for short-term rentals (STRs) 10, 11, 12, 13 and 14, which means I’ll be busy ordering furniture and all sorts of other stuff to put in them for a little while. Whew! If all that’s not enough, we here at CFD are about 32,000 downloads from reaching another milestone. Our Cash Flow Diary podcast will soon hit the million marker!! Instead of going into everything my teams and I are up to here, let me give you a link to a recent Diary Entry that I livestreamed. The Diary Entries are something I’m doing a lot more of lately. In fact, this one is #99. You should watch as many as you can, which means you need to follow me. The buttons are below the video. Entrepreneurs Gotta Keep Moving, No Matter the Season!! At this time of year, you might think you get to relax and take a break. Leave the relaxation to those in the corporate world. All year long they’re waiting for their paid “time off.” You’re an entrepreneur, which means no one is giving you paid time off. You get to create that for yourself. It’s called quitting your 9-to-5 J-O-B to pursue the life you desire. But until that happens, guess what? You get to work UNTIL the tasks get done and you have achieved your goals. There’s no better way I know of to accomplish that goal than getting involved in real estate investing. For me most recently that means scooping up lots of properties to turn them into short-term rentals. That means great places for vacationers and corporate travelers to stay while they’re in my neck of the woods. But that’s not where I started. If you haven’t read my book yet, you can grab the downloadable e-version for free at www.cashflowdiary.com/freebook. Aside from STRs I’m also looking at a few fun and totally non-traditional investments right now. I talk a little about that in my video, so be sure to click it at the top of this article and watch it. I think it’s about 2/3 of the way in. As you can see, I’m not slowing down at this time of the year or any other time of year. Nor should you. Instead, set goals and go for them… FAST. In fact, don’t be afraid to move faster than the average real estate entrepreneur. The more properties you get under contract faster… the more income you will earn. That’s how it works for me anyway, and I want you to learn to do exactly what I do. It just takes the right training and information. Real Estate Entrepreneurs NEVER Stop Learning. One might think that I have no need to study or learn anything new now that I have hundreds of units of property and am doing pretty well in real estate investing. But that would be an incorrect assumption. Believe me… I am STILL learning new things. Like with my STRs. God knows I learn something new in that area every time I take down a new property and turn it into an STR. That’s the way it is as an entrepreneur. If you don’t keep learning you will be left behind, because things change really quickly in this world, like with technologies that you can use in your business. Take me, for example. What if I had just stopped learning after I got what I needed from my education to do wholesale deals? I might still be wholesaling properties right now, but that wasn’t enough for me, because I knew there was so much more I could do inside real estate. What if I had stopped learning once I got the information and expertise I needed to invest in single-family properties and then multifamily properties? That’s called buying and holding so you can charge rents, which can become quite lucrative. I could have stopped there, but I didn’t want to. For some that would be enough, but after I got good at that I hungered for more. I wanted to do something here where I live in southern California. So I kept my ear to the ground and I kept asking questions. I knew a few investors in our network who were doing STRs. They got the ball rolling for me, steering me in the right directions for the different bits of information I would need to try my hand at this new thing. What happened next was magical… or it felt magical. It took hard work up front, but I decided I really like the STR space and now have a goal of getting 50 units. YES… 50!! The good news is that I’m well on my way. You must take action and you must keep going… even during the holiday season. You are not going to get to relax till you have reached a few goals. Then you can celebrate. If you like the idea of doing a few STRs yourself, you need to get the right education and training. 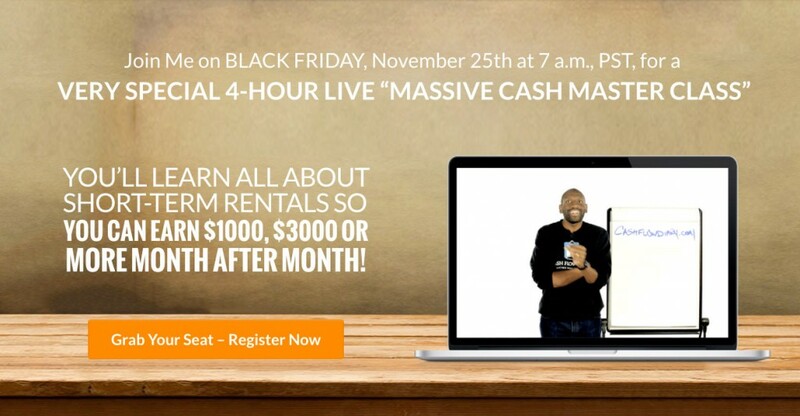 Fortunately, we are still offering our recordings of my Massive Cash Master Class that gives you more than 4 hours of training on how to create your STR business. Oh, and before I forget… HAVE A WONDERFUL HOLIDAY SEASON AND A FANTASTIC NEW YEAR! !